It drives me absolutely nuts as an art historian the way Western art history textbooks treat Mesoamerican and South American cultures in a peripheral way, yet fawn all over ancient Greece and ancient Rome as the high points of aesthetic development. The fact is that the Americas, as well as East and Southeast Asia, had sophisticated, thriving empires during the same period of the flourishing of Greece and Rome. In fact, they outlasted them. What was happening with the Roman Empire between the late 400s and 600s CE? Oh, nothing. That’s right, it had collapsed. Although Peruvian cultures waxed and waned just like Rome, there was a sustained period of flourishing cultures from around 1500 BCE until the Spanish invasion and conquest in the 1500s CE. The Nazca (flourished ca. 250 BCE to 650 CE) are thought to have arisen out of the Paracas culture, which flourished ca. 750 BCE to 100 CE. The Nazca culture was characterized by a collection of independent chiefdoms. Although there are cultural and artistic similarities among these communities, they did not—like other Mesoamerican and South American cultures—build great cities of standardized design. As the Nazca expanded their influence, they traded with inland mountain regions where alpacas and llamas were raised, and rainforest regions where they secured the feathers of tropical birds for garments. The best source for Nazca art objects is from their tombs, which were often 4 to 5 meters (13 to 16 feet) deep. 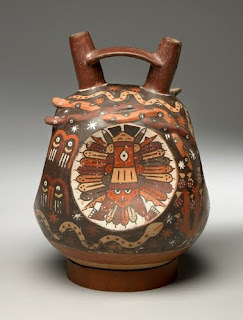 The Nazca culture produced sophisticated ceramic art, gold and metal objects, and particularly sophisticated textiles. Textiles were the most highly-prized objects after gold in Peruvian cultures. 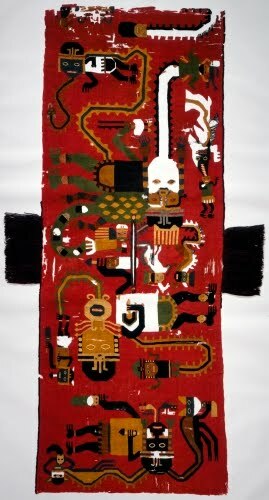 The Nazca were skilled in all of the Andean techniques, including several types of weaving and embroidery, and they also painted designs on plain cotton cloth. Abstract figures were especially popular in designs and most often are depicted participating in harvest scenes that show such foodstuffs as maize and beans. Animals, similar to those in petroglyphs and pottery designs, were also a popular subject.